EUR is acting stronger against USD due to the German IFO surveys for March, on the other hand, USD is getting weak because of Trump’s health-care issue. 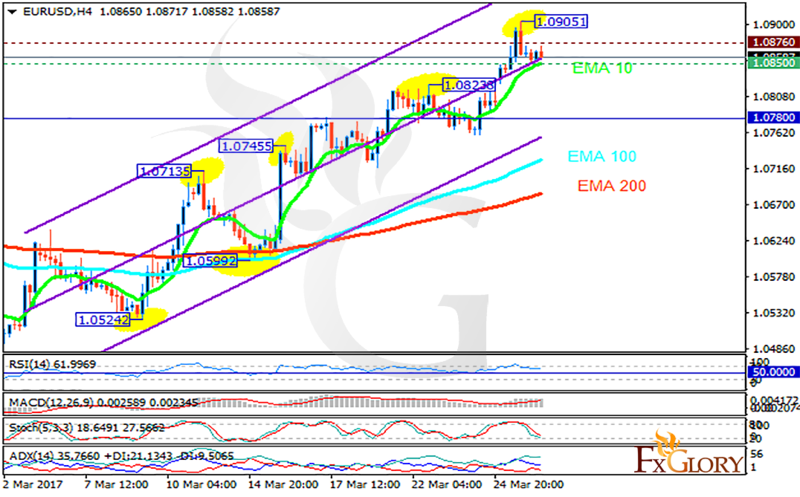 The support rests at 1.08500 with resistance at 1.08760 which both lines are above the weekly pivot point at 1.07800. The EMA of 10 is moving with bullish bias along the ascendant channel and it is above the EMA of 100 and 200. The RSI is falling towards the 50 level, the Stochastic is moving in low ranges and the MACD indicator is in positive territory. The ADX is showing buy signals. Long positions are recommended targeting 1.0900.